As I've received several questions about the water lily that's pictured as my page header, I thought you might enjoy hearing the story of how it came to be. Early in 2007, members of a group of Delaware artisans to which I belong were invited to attend an exhibit titled Made By Delaware Hands. It showcased 120 Delaware-made objects from the 18th to 20th centuries. We were asked to choose a piece in the show and seek inspiration from it, creating something in the medium of our choice. Our contemporary work would bridge the past and be displayed alongside the original objects in an exhibit that was to be held later in the year. I really enjoy the challenge of making something that otherwise I might not have considered, so... game on! The piece that caught my eye was a rather astonishing, tall, and intricately detailed floral seashell arrangement. I wish I had a picture of it to show you. At the top was a realistic water lily with petals composed of mussel shells. The arrangement had been made by a Civil War veteran in the late 1800s. 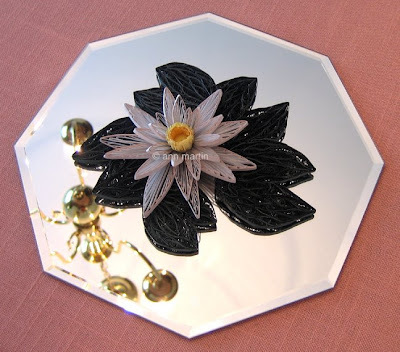 I knew immediately that I would translate the seashell water lily to three dimensional paper filigree. I used deep green metallic paper to make the lily pad and silver-gilded white paper for the petals, each of which was lined with very pale peach paper to represent the soft coloring on the interior of the mussel shells. Here's a picture of the finished piece, but please excuse the chandelier reflection in the mirror! What a great blog you have! Thank you for sharing such wonderful works. Thanks so much, Monica. I'm glad you're enjoying the posts.